(AP) -- Intel Corp. has sent a strong message to Wall Street: Tablets may be transforming the computer industry, but there's still a lot of money left to be made in the huge market for traditional PCs. Despite all the hoopla around Apple Inc.'s iPad and an army of competitors, on Tuesday Intel reported that its first-quarter net income jumped 29 percent as corporate demand for new PCs led to lots of orders for Intel chips. The results easily topped analysts' projections, as did Intel's second-quarter guidance. Its shares rose more than 4 percent in extended trading. The stock move reflects the belief of many investors that Intel has plenty of opportunities to plumb its core businesses for more profits as it adjusts to a shifting technology landscape. Intel, at 43 years old, is among the old guard of the computer industry. It's the world's biggest semiconductor company, with some 80 percent of the world's PCs running its processors. Newcomers are challenging its dominance in PCs with mobile gadgets including smartphones and tablets. But the latest numbers show that Intel has scale and some of the most sophisticated manufacturing technology in the world on its side to beat back those pressures - for now. Intel earned $3.16 billion, or 56 cents per share, in the first quarter, which was higher than the 46 cents per share that analysts polled by FactSet expected. A year ago, Intel earned $2.44 billion, or 43 cents per share. It brought in revenue of $12.8 billion, a 25 percent increase from $10.3 billion a year ago and higher than the $11.6 billion that analysts expected. The second quarter revenue forecast of $12.3 billion to $13.3 billion was also higher than the $11.9 billion analysts were expecting. Intel shares rose 91 cents, or 4.5 percent, to $20.77 in extended trading. Strong corporate demand for PCs is helping Intel overcome a series of problems. It had a serious product blunder in January when a design error in a new chip delayed production of new PCs and Intel said it expected the gaffe would cost $1 billion to clean up; PC demand in the U.S. and Europe is weakening because of tablets and economic worries; and demand in Japan has fallen because of the deadly earthquake and tsunami in March. Intel also benefited from having an extra week in the latest quarter than it normally has, because of a change in the way the company measures its quarters. The company's cutting-edge manufacturing technology, which requires billions of dollars in investments every year, also helps Intel wring more profit from its businesses. The technology allows Intel to make the circuitry on its chips smaller, reducing costs while boosting performance. Still, the threat from tablets is real, and Intel and other companies in the PC industry are scrambling to find their place. Goldman Sachs analysts say they expect that as many as 21 million people may buy tablets instead of laptops this year, and that the number could jump to 26.5 million in 2012. They also expect that the iPad, which went on sale just a year ago, will be so successful it will make more money for Apple than the company's entire Mac division by the end of this year. While tablet demand is expected to grow sharply, the chasm between the size of the tablet market and the size of the PC market is large. Goldman Sachs says it expects overall tablet sales in 2011 to be about $35 billion, with some 60 million units sold, while the PC market should be higher than $250 billion, with nearly 370 million units sold. If that prediction comes to pass, that's still a remarkable achievement considering that commercial PCs have been around 30 years. That's a worrisome trend for Intel because Apple designs its own chip for the iPad, and other tablet makers are using other chips that consume less power than Intel's. Intel has chips for both smartphones and tablets, but it's late to the game. The question isn't whether Intel will be frozen out of either market entirely; Intel's substantial resources and engineering talent make it a threat in any business it chooses to enter. But it has stumbled before in entering new markets, and some analysts question whether it can have a meaningful impact on smartphones or tablets considering it's facing entrenched competitors in phones, and Apple is seen remaining the dominant force in tablets. 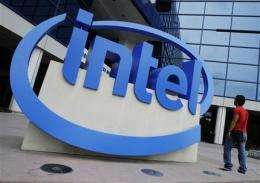 Intel has argued that it expects the new classes of devices to expand the overall computer market. In an interview with The Associated Press, Intel CEO Paul Otellini said he still holds that belief. He said it will take years to assess the impact of the trends, but that data Intel has collected so far don't support the idea of heavy "cannibalization." One of the reasons is price. Tablets can be several hundred dollars more expensive than a PC. Another is tablets' role as a content-consumption device, and their limited abilities to create content. "All of these devices have been additive. They all find a niche for different people, and they're all still relatively focused on mature markets," he said. "In emerging markets, the PC is much more affordable, and because of its content-creation abilities is the device of choice." The chip design stumble could have been a boon for Intel's smaller microprocessor rival, Advanced Micro Devices Inc., but the fast turnaround likely prevented major losses in market share. AMD reports its first quarter results on Thursday. Otellini said that Intel didn't see much of an effect from the March 11 disaster in Japan. That's because the company doesn't have factories in the country and because PCs are built around common standards that are easily met by suppliers outside of Japan. Japan is a major supplier of memory chips and key materials for making computer chips.